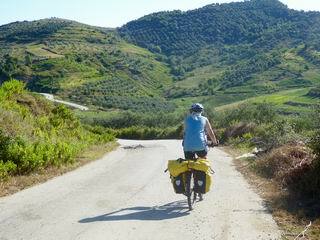 Cycling in Albania is tough, but certainly feasible. Expect lousy road conditions including open drains, some abysmal driving from fellow road users and roads that barely qualify for the title. 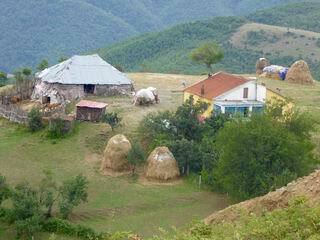 (Lonely Planet: South Eastern Europe). 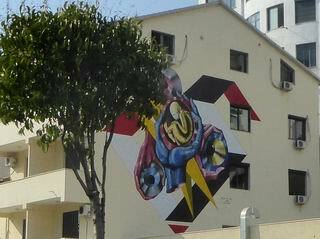 Always up for a challenge, we just had to check itout! And withmore people speaking Albanian in Switzerland than Romantsch, the 4th national language, we had an added incentive. 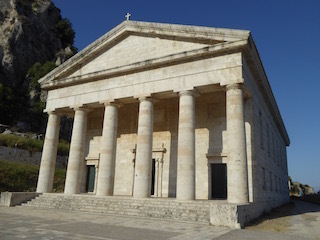 To avoid backtracking, we flew to Corfu in Greece, a short ferry ride from the southern Albanian border, and flew back from Podgorica in Montenegro, across the northern border. Old fort, Corfu town Never having been to Corfu before, we cashed in on the opportunity and did a loop of the scenic northern half. 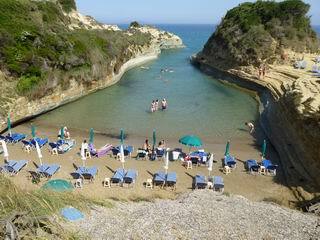 Despite its long history of tourism, Corfu still has a laid back atmosphere, with quiet roads hitting charming beaches and coves, offering a refreshing break from the 32- degree heat. 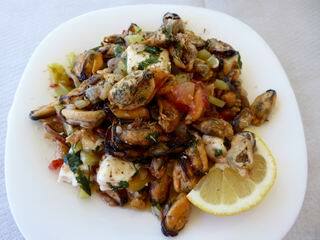 We’ve taken note for a future island hop in the Ionian Sea! 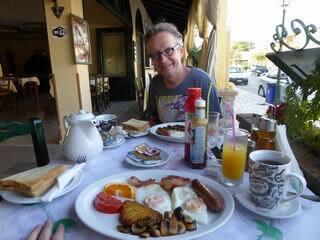 It’s hard to beat a fry-up! 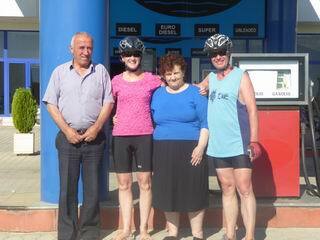 On arriving at the ferry port in Albania, we were greeted by an Albanian family based in Dublin. 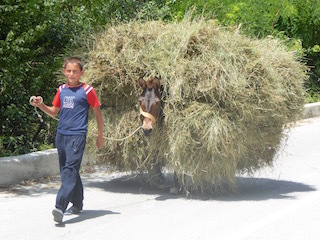 They reassured us that our stay in Albania would be our best holiday ever. The standard was set! 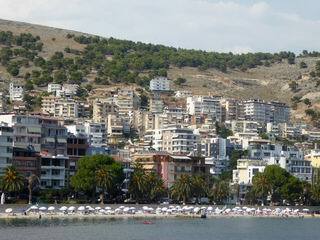 In 2003, the first hotel was built in Saranda. Now some 13 years later, there are probably 10 hotel beds for every local resident. However, the spacious promenade and numerous beaches somehow soften the blow. 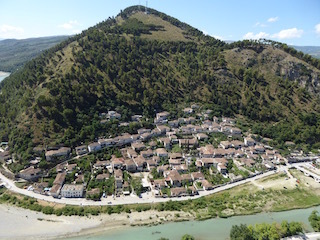 It has become the holiday resort for all the neighbouring Balkan nationals, who take to strutting their stuff every evening around sundown, in what has become known as the xhiro. Dressed in their finery, the object is to see and be seen… some doing the circut two or three times to be sure, to be sure! 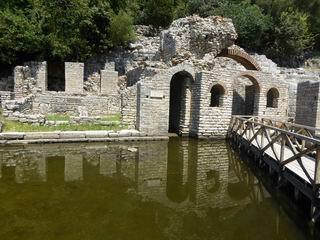 The Roman baths Just south of Saranda, on the Greek border, Butrint is not to be missed. 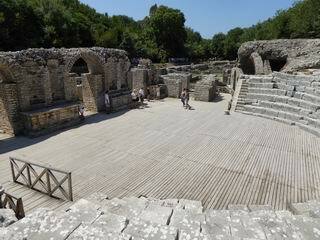 This UNESCO World Heritage site, dating back as a trading post to the 7th century BC, was in subsequent use by Ilyrians, Greeks, Romans, Venetians and the Ottoman Empire. 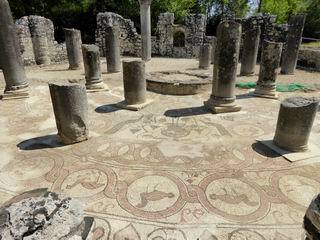 The ruins and mosaics remaining today aptly reflect these various episodes of history. 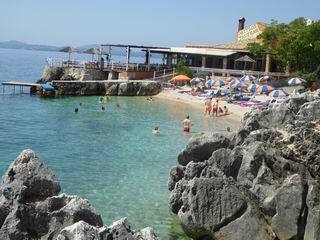 The Albanian Riviera comes at a price. 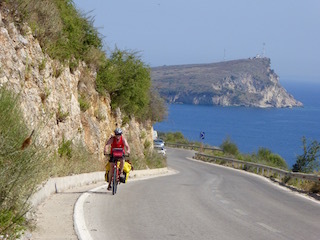 Unfortunately, the coastal road that links the beaches together is not as flat as the water! Add 33°C and you have a real work out. 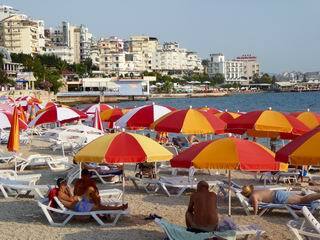 Beach umbrellas and sunbeds were on offer for midday siestas, and there was no shortage of restaurants en route. 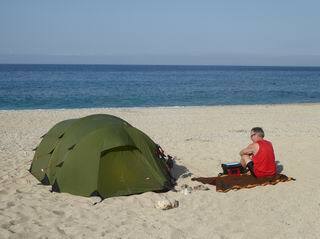 Less accessible beaches, like Gjipe, with 4X4 access, made for perfect quiet camping. 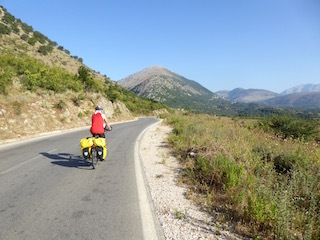 The northern exit was through Llogara National Park and a 1027m pass. 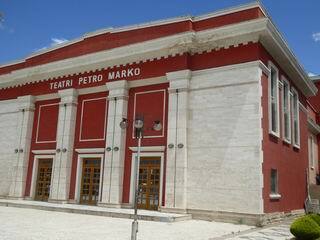 Vlorë, now the second biggest city in the country, is where Albania was declared an independent republic in 1912, after 5 centuries of Ottoman rule. The passionate multilingual guide at the Independence Museum left no doubt in our minds as to the rightful place of Albania in the League of Nations! The map displayed in the museum showed a more extended version of the Albania we know today, including Kosovo and parts of Macedonia, Montenegro and Greece. This is what was proposed by the independence movement reflecting ethnic realities, but not what was granted by the London Conference. 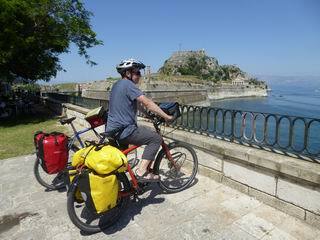 On our way inland, we cycled through the biggest onshore oil field in Europe. 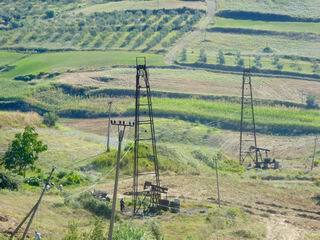 Rusty old pumps where squeaking away in the background between the haystacks and olive groves. 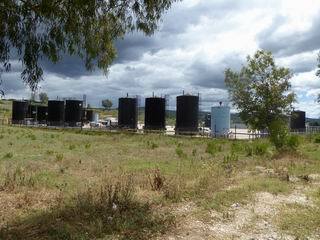 The Chinese recently bought the rights to the Albanian oil fields, but we’re not sure if it was the scrap metal or the oil that they were interested in! 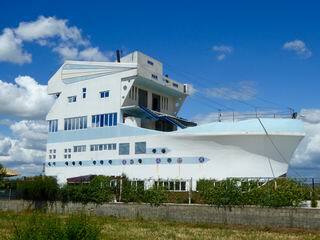 Ship-shaped bar… and not a wave in sight! 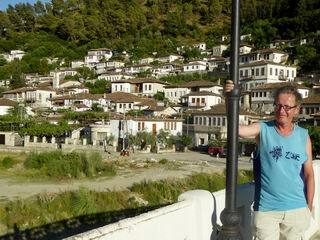 Kurt in Berat Pleasant rolling hills were the order of the day into Berat, one of the oldest cities in Albania. 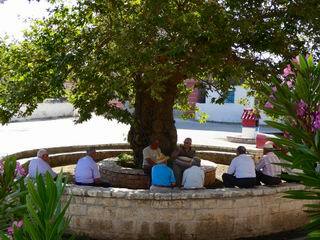 It was famous for wood carving in the 18/19th century and is now a world heritage site. 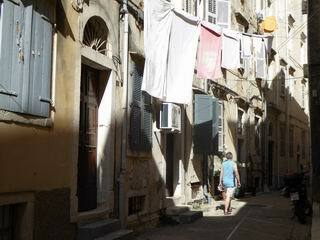 The castle hill is densely packed with houses dating back to the Ottoman Empire. 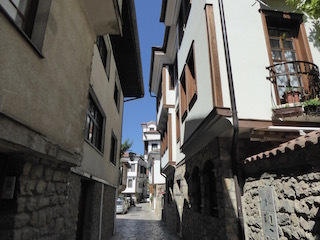 Their endeavour to maximise on light earned Berat the title: The city of a thousand windows. Next on the cards was Devolit Valley. The cycle to Gramsh was both pleasant and diverse, but what made it all the more worthwhile was a closed road, just for us cyclists. 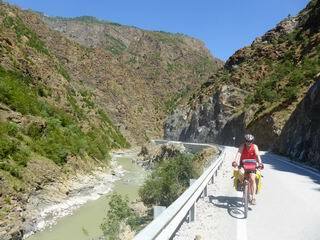 The construction of a hydroelectric plant and access roads offered us the chance of a test ride before the locals. Runway material! A road to ourselves! A British health and safety employee of the Norwegian company building the plant, actually speed tested us en route and insisted that we should be wearing high visibility vests in this construction area. A bit of Irish banter was all that was needed to relax his adherence to the rules, and we reclaimed the road! 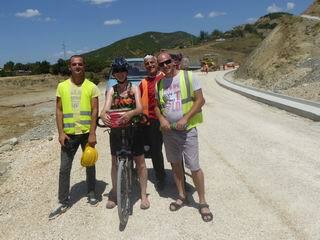 Friendly locals in high vis. vests! After Gramsh, the landscape became more spectacular and although the road was less than runway material, it was well worth the effort. 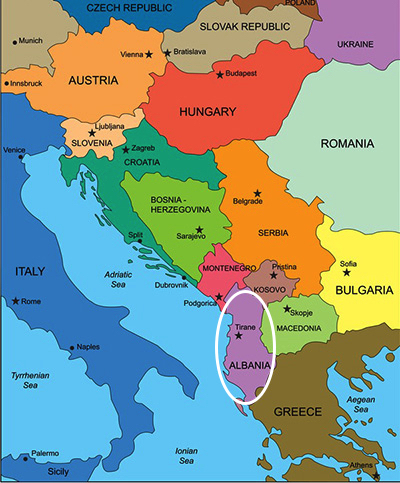 Albanian independence was short-lived as during World War 2 it was occupied by the Italians, Greeks and Germans. 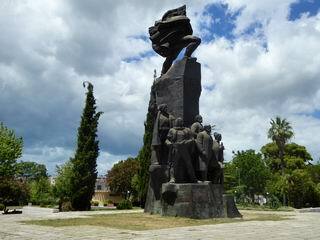 Then, in 1946 Enver Hoxha proclaimed the People’s Republic of Albania, starting 40 years of communist rule. Obsessed with the idea of another foreign invasion, he ordered the construction of a few hundred thousand bunkers, which appear like clusters of mushrooms, especially in border areas. Rusty reminders of communist times Throughout Albania, there are remnants of communist industry, but 30 years of inactivity was enough to turn them into rusty reminders of the secluded, insular society that was forced into self-sufficiency under Hoxha rule. 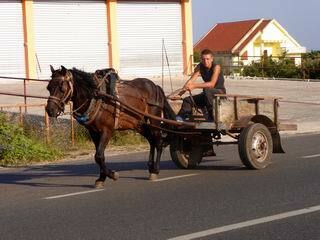 The Albanians are an exceptionally friendly and welcoming folk. 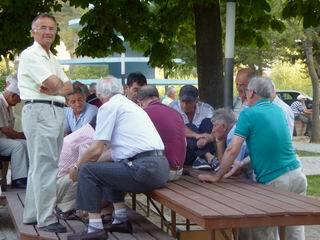 Our local lingo extended as far as the typical greetings, numbers and questions, which at times was unfortunately a hindrance when communicating with the older population. Communicating with hands & feet! Men solving the problems of the world! In 1967, Hoxha declared Albania the first atheist state in the world, demolishing or closing all existing Muslim, Catholic and Orthodox establishments. Religious practice was strictly forbidden and punished with extended jail sentences or execution. 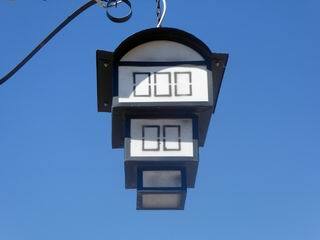 As a result, the locals today have a refreshing and accepting à la carte approach to religion, if any at all. Crossing the border into Macedonia, the presence of a multitude of Orthodox churches and mosques reflects the milder communist approach of ex-Yugoslavia. 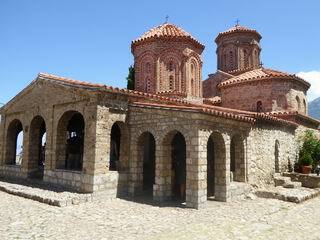 Our first stop was the monastery of Sveti Naum, a popular place of pilgrimage on Lake Ohrid. Evening Xhiro in Ohrid Ohrid town itself, is a real jewel dotted with churches, traditional houses, bars, markets and anything else a tourist might need. Michael O’Leary has even spotted its potential and has added it to Ryan Air’s destinations. 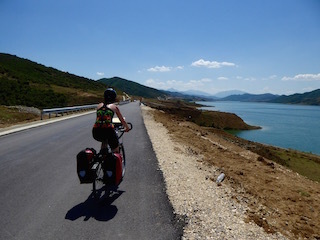 The ride along the Black Drin River back to Albania was an absolute delight. 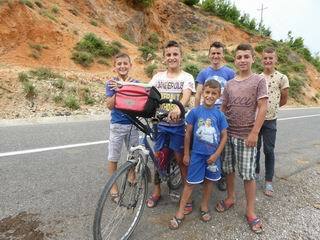 The mountains were left and right of the road, as the Macedonians are not shy when it comes to building bridges! 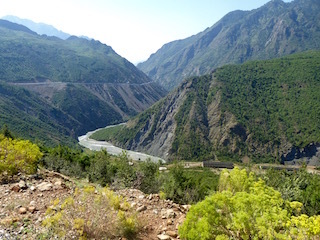 Back in Albania, the north east, bordering Macedonia, Kosovo and Montenegro, is both beautiful and spectacular, as well as a real challenge. The bridges here are about 15m long, and they are often a long way down! 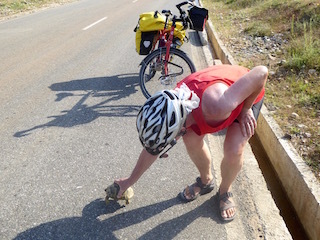 It was in this area that Darina’s bike hit 50,000 km. 45 countries later, it may be time to send the blue wonder into a well-deserved retirement. The search for a suitable replacement has begun! 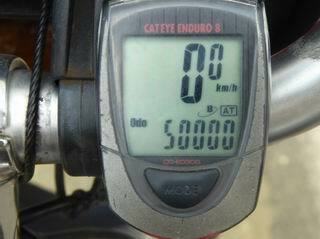 Here’s to the next 50,000km! 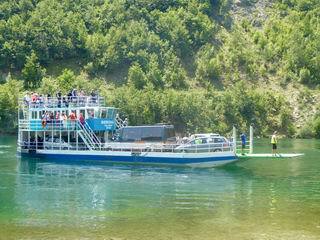 One of the biggest tourist attractions here is the boat ride on Komani Lake. 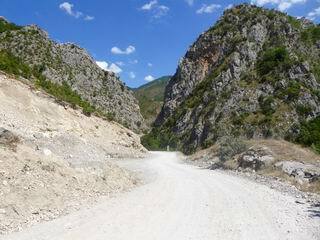 The 2.5 hour trip takes in wonderful scenery, through a gorge carved out by the Drin before it was dammed for hydro-electric power. Hotel/Restaurant under the bridge We camped near the power plant at the end of the trip, where you also have the unique opportunity of sleeping in the hotel… under the bridge! We can highly recommend the restaurant attached. 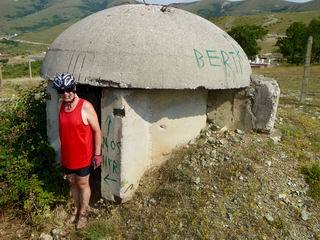 Speaking of food, we ate like kings throughout Albania, and portion sizes were well fit for hungry cyclists. 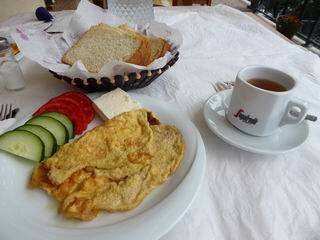 Our hotel breakfast was typically an omelette with tomato, cucumber and feta cheese, served with coffee. Darina’s tea was often served in a tiny expresso cup. 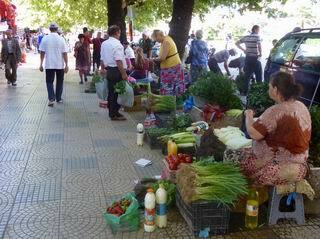 Anyone in the mug industry would have a huge market opportunity in Albania! 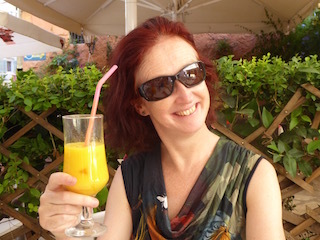 The local breakfast, on the other hand, consisted of a glass of water, an expresso and a raki (local spirit) at 7am, followed by a full meal at about 10 or 11 am. Stuffed mussels The coas t has fabulous seafood, while inland there were more goat and lamb meat dishes on offer. 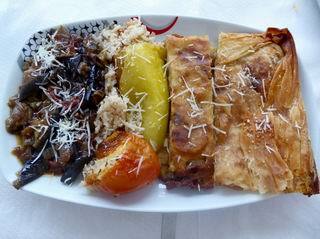 Of course, stuffed aubergines and peppers were a common fixture on menus, as was burek (stuffed pastry). Generous salads and bread accompanied every meal. 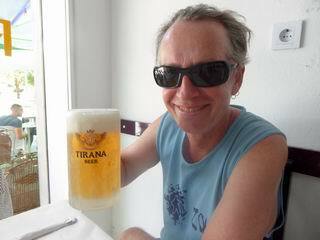 Kurt discovered a few local brews that proved delightful rehydration therapy after a long slog in the mid 30s. 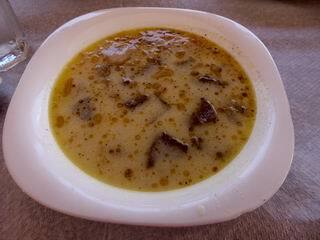 One of the local specialities is intestine soup, which is actually quite tasty! 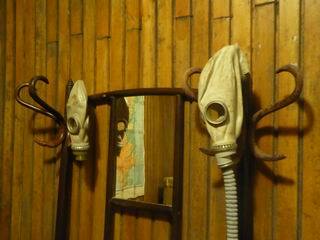 Accommodation was sparser in the north east, but every town had a basic hotel. 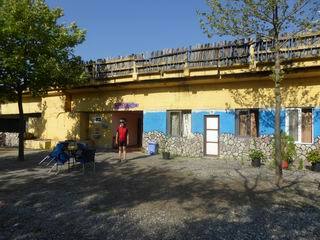 B&B en suite rates in Albania were generally 10-15 Euros/person. Kurt saved suicidal turtles on a daily basis! 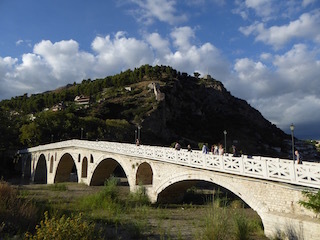 Shkodër Shkodër, a historical castle town, was home to the democratic movement that brought an end to communism in 1992. 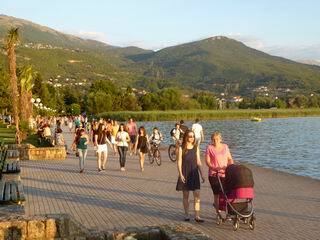 Situated near Lake Shkodër, forming the border with Montenegro, it was a lovely place to while away a couple of days. And judging by the number of weddings there, it’s obviously treasured by the locals too. 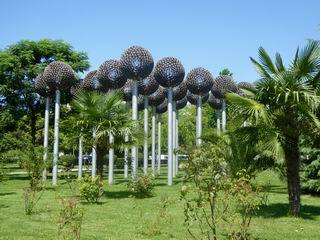 We did a day trip by bus to check out the busy capital city, Tirana. It was a good move considering the traffic we encountered en route . 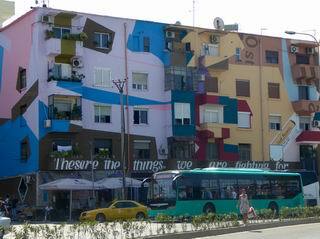 In an effort to cheer up the place in 2000, Edi Rama, the then local mayor and now Prime Minister, introduced the Clean and Green project, planting trees, creating parks and painting the facades in bright primary colours. Street art in the Blloku district The Blloku area, formerly reserved for the communist high and mighty, is today a colourful, buzzing centre full of cafes, restaurants, clubs and thought-provoking street art. 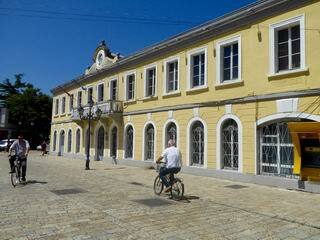 The central square, surrounded by government buildings, is dedicated to Skanderbeg, the local freedom fighter. Active in the 15th century, he managed to keep the Ottoman Empire out for 25 years. 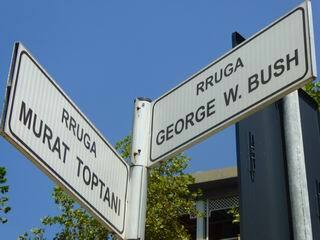 Albanians boast about the wonderful international relations they have with the USA and there is even a street in Tirana named after George W. Bush. 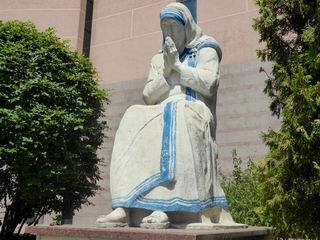 St. Teresa- most famous Albanian You are probably wondering if you know of, or have ever met, any Albanian. Well , the most famous Albanian worldwide is Rome’s most recent Saint: (Mother) Teresa of Calcutta. Born in present day Macedonia in 1910, she learned English in Ireland at the tender age of 18, before spending the rest of her life doing missionary work with the poor in India. 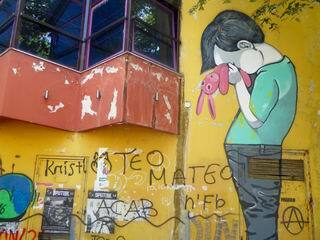 Statues and plaques to her memory are dotted all over Albania. 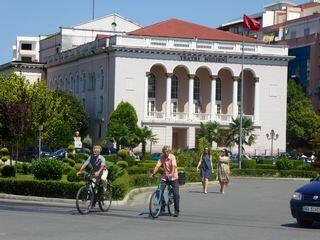 The highlight of our trip to Tirana was the Bunkart museum. Located out of town in a huge bunker built by Hoxha for himself and his parliament, it took a good 2-3 hours to stroll through the 5 underground stories. The various rooms now contain fascinating, educational and eye-opening exhibits and art installations relating to the resistance movement during the second world war and the communist era afterwards. In memory of Hoxha When Hoxha died in 1985, his daughter and son-in-law designed a pyramid-shaped museum dedicated to his legacy. 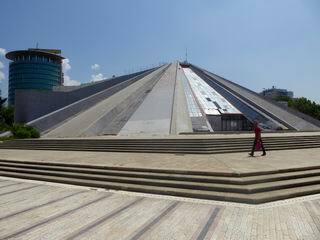 On it s opening in 1988, it was considered the most expensive building ever built in Albania. However, it’s shape had an unnerving resemblance to a dark chapter that had yet to unfold. In the 1990s, just as Albania was recovering from its communist seclusion, a number of dodgy investment companies were happy to receive deposits from the general public. Most of this money had been sent home from the 400,000 Albanians living abroad. These investment companies turned into a pyramid scheme, complete with money laundering from drug and weapon smuggling, and involved the whole country. It is estimated that 1.2 billion dollars were lost when the whole scheme collapsed in 1996/7. A civil war broke out, political control was lost, plundering raged, and 2,000 people were killed. An international peace corps restored order and new parliamentary elections were held in June 1997. With the help of the IMF and the World Bank, the remaining pyramid schemes were liquidated. 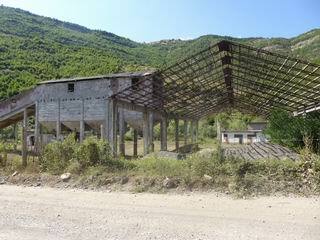 Considering its grim past, Albania has come a long way. 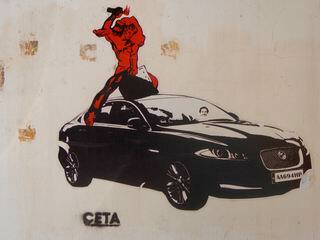 In 2016, it is still regarded as one of the poorest countries in Europe, with unemployment hovering at 17%. Considering that, the absence of beggars says a lot about local pride and the extended family as a successful social system. 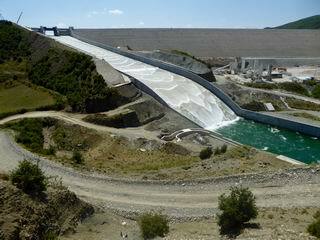 Foreign investment is helping with Albania’s economic recovery and hydroelectric power plants will soon see Albania self-sufficient, as far as electricity goes. 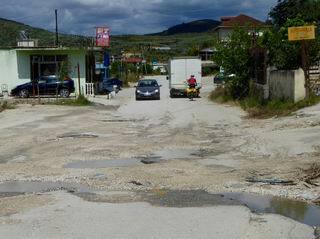 Poor roads – a thing of the past Lonely Planet needs to work on an update. 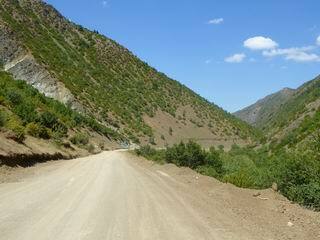 On our 900km route, we encountered just 35km of unpaved stretches. There are loads of newly built roads and the traffic was far from dramatic. As far as tough goes? That has become our middle name! 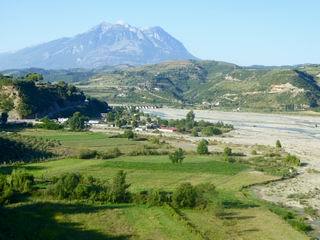 Albania boasts amazing natural beauty and true genuine hospitality. 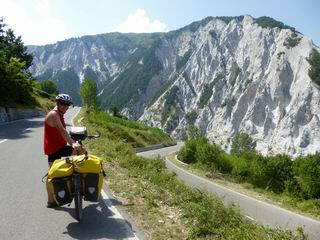 Beyond the coastal stretch, the Albanian Alps and a number of bigger towns, tourism is pretty much non-existent. This is certainly something that will change in the not-too-distant future, thus creating jobs and improving the GDP. Go check it out– it may even be your best holiday ever!